Nokia is looking to go out with a bang before being swallowed up by Microsoft, as the company unveiled a portfolio of new devices including its first tablet - the Lumia 2520 - and two new smartphones in the Lumia 1520 and 1320. At Nokia World: Abu Dhabi the firm announced its Lumia 2520 tablet, which boasts a 10.1" full HD (1080p) display that, like Nokia’s smartphone screens, has been designed to provide excellent readability even outdoors in direct sunlight. The Lumia 2520 is powered a quad-core Qualcomm Snapdragon 800 processor clocked at 2.2 GHz per core, which is backed up by 2 GB of RAM and operates on Windows RT 8.1 out of the box. In terms of optics, users get a 2 MP wide-angle front-facing snapper and 6.7 MP main camera that packs Zeiss optics and like the shooter of the Lumia 925 (review), enables users to capture shots in low light (f1.9 aperture). Also onboard is LTE (4G) connectivity, NFC, aGPS with GLONASS support, Bluetooth 4.0, Wi-Fi 802.11n, Microsoft Office and Outlook pre-installed, and a massive 8000 mAh battery. Users have access to 32 GB worth of internal storage that can be doubled via a microSD memory card slot. Nokia’s Lumia 2520 will be available in red and white in a glossy finish as well as cyan and black in a matte finish, and is expect to start shipping during Q4 2013. Initial roll out is scheduled to kick off broadly in the US, UK and Finland, with more countries following shortly after. No local release or pricing info is available, with the estimated retail price of this tablet at least Stateside coming to $499 (around R4 910). Nokia will also launch the Power Keyboard accessory alongside the tablet for a recommended retail price of $149 (about R1 466). This keyboard delivers up to five extra hours of battery life, two built-in USB ports, and acts like a protective, wraparound cover for the tablet. Following on the heels of the Lumia 1020 is the Lumia 1520 smartphones, which sports a phablet-esque 6" 1080p ClearBlack LCD. On the back of the device resides a 20 MP PureView camera that packs Zeiss optics, OIS (optical image stabilisation), 2x lossless zoom, and the ability to record 1080p videos at 30 fps OIS. The excellent video quality is backed up by Nokia Rich Recording, which sees the device record audio via four built-in microphones for enhanced quality and volume levels. This smartphone is powered by a Qualcomm Snapdragon 800 quad-core CPU running at 2.2 GHz and operated on Windows Phone 8. Also onboard is a large 3400 mAh battery with built-in wireless charging functionality, LTE connectivity, a 1.2 MP wide-angle front-facing snapper, 2 GB RAM, NFC, aGPS plus GLONASS, Bluetooth 4.0, 32 GB internal storage that is expandable by up to 64 GB via a microSD memory card slot. Nokia stated that its Lumia 1520 will be available in yellow, white, black and glossy red and will start shipping within Q4 2013 for an estimated price of $749 (approximately R7 370). The phablet will make its way to places like Hong Kong, the US, China, and UK first with other markets following soon thereafter. No South African release and pricing info is currently available. 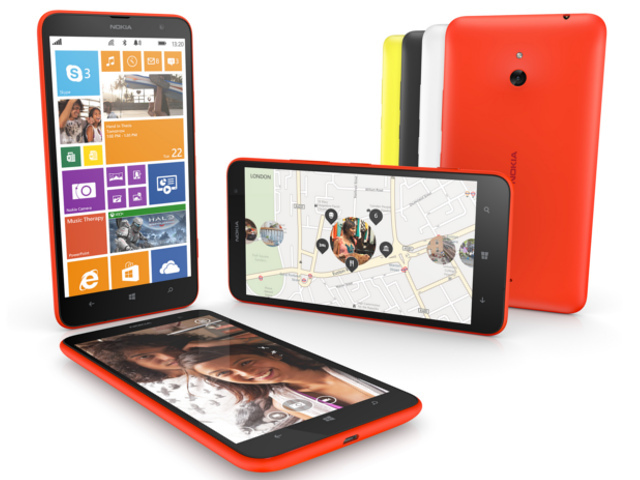 Nokia’s Lumia 1320 also boasts a 6" HD IPS LCD, but its resolution comes to 720 x 1280 and it is protected by Gorilla Glass 3. As with the Lumia 1520 this screen features Nokia’s Super sensitive touch technology, meaning users will be able to utilise the display even whilst wearing gloves. Powering the Lumia 1320 is Qualcomm’s Snapdragon 400 dual-core processor running at 1.7 GHz per core, which also does duty in Samsung’s Galaxy S4 mini (review) and is coupled with 1 GB RAM. Users only get 8 GB internal memory and can expand this by as much as 64 GB via the microSD memory card slot, as well as the additional 7 GB worth of cloud storage by way of Microsoft’s SkyDrive service. Also amongst the lengthy features list is a 3400 mAh battery, Bluetooth 4.0, Wi-Fi 802.11n, an 0.3 MP (VGA) front-facing snapper for videocalls and capturing selfies, and a 5 MP autofocus main camera. The Nokia Lumia 1320 will be available in Q1 2014 for an estimated price of $339 (around R3 335) in China and Vietnam, followed by other Asian markets, India and Europe. As with the rest of the new devices, no local release info is available. In related news, analytics company Gartner recently revealed that the worldwide combined shipments of devices (PCs, tablets and mobile phones) are now projected to reach 2.32 billion units during 2013.